Are you busy planning the perfect open enrollment season for your company? Maybe you’ve even organized a benefits fair to provide employees with everything they need to take full advantage of their options. If so, there’s one open enrollment mistake you need to know about—a problem that’s keeping most companies from reaching and engaging more people. And the great news is you still have plenty of time to avoid it! The biggest barrier to a successful open enrollment period is TMI (Too Much Information) to process in TLT (Too Little Time). This syndrome usually shows up in the form of a one-off wellness fair that overwhelms employees with an indigestible mass of words and data. They walk away with a lot of info but little clarity on the how, when or why of open enrollment. If it’s happening on one date, or even across several, plenty of people can’t make it work with their schedules. Those are missed opportunities to reach employees. Usually all of the info is available only in a hard-copy format. If you’re like many of the companies we’ve known and worked with, you’re trying to launch many different benefits or wellness programs all at once. Often there are no specific, hard deadlines. That might work for people who are wired to decide on benefits options quickly. But open-ended thinkers won’t budge unless they’re moved by the fear of missing out. This one’s huge: the failure to send follow-up communications. Sure, organizing and launching the fair was a big effort, but your outreach can’t stop there if you want to see high enrollment and engagement. If these troubles sound familiar, rest assured we can help you head them off and make this your best open enrollment season ever. Let’s talk about ways to lower these barriers and connect more people than ever with the benefits they need to be happy, healthy employees! If enrollment involves paperwork, it’s a barrier. Especially if there are more action steps after leaving the benefits fair, like filling out forms at home or remembering to return the docs to the HR office! Let’s not go there. Instead, use technology wherever possible so employees can click and sign up in a hurry with as few hurdles as possible. Digital enrollment simplifies the process because no matter how they learned about your benefits offerings, they can sign up easily on their own time. That means there’s no opportunity lost if they’re unable to attend the fair, unready to commit that day, or unwilling to fill out forms to return. And if you can allow them to enroll onsite at your fair, all the better! Relying on one-time, or one-channel approaches is another big barrier for open enrollment. We’ve already said that a single benefits event or wellness fair won’t be attended by all workers. But there are other examples of this one-off approach that need correcting. Consider holding them on multiple dates, and at various hours on those days. The lunch hour might not work for some employees, but they might have plenty of time to attend if you hold another event later that week in the afternoon or the morning. And if you’re a multi-site operation, don’t limit yourself to a fair at only one location. Bring the excitement and learning to each site. And as mentioned above, don’t rely on the fair to be your only communications touchpoint. The scope and excitement of open enrollment cannot be contained in just one email. That’s why you’re going to send multiple emails throughout the open enrollment period. Don’t load them down every time with every detail or long lists. Instead, change up what you include and keep the messaging conversational. Wherever possible, keep the emails simple and include a link to sign up online for what’s available, as we suggested above. Most mobile phones have text capability, so why not use it to increase sign-ups this year? It’s yet another way to communicate. And sometimes a quick text saying, “Don’t miss this year’s Benefits Open Enrollment!” with a link could be just the thing to capture those hard-to-reach workers. Deadlines don’t all have to happen on the same date; in fact, the various programs you offer might make that impossible. But don’t forget what we mentioned about common barriers at open enrollment time—there will always be employees who hear that there’s no deadline and take it to mean there’s no urgency. As an HR professional, you know that employees should feel some urgency to sign up, because you’re offering them excellent programs with the potential to change their lives in a positive direction! Sure, some people will be self-starters and get their paperwork in. But for others, deadlines are a helpful anchor for action that encourages them to follow through on enrollment. Even if the deadline is a promotional or prize-driven deadline, that’s better than no deadline at all. Obviously, the deadlines are something you should include in your communications. As we said before, we’re big fans of benefits fairs. But if you’re going to do one, it needs to work in combination with the strategies listed above. And most importantly, there needs to be a follow-up plan. What does that look like for your company? Part of it is using multiple forms of communication throughout the open enrollment period. But there are a few more steps you can take to continue pursuing enrollment after the fair. It won’t be possible for every company. And even smaller operations might not reach every employee this way. But there’s enormous opportunity to help some workers by reaching out individually. It’s the HR equivalent of a thank-you note. Let’s say you had a conversation with someone at the fair who seemed seriously interested but was hesitant or confused. They’d be a great candidate for either a follow-up email with more information, or even a quick meeting invite offering to answer more of their questions. They’ll be much more likely to enroll if they see you’re ready to help them answer each and every question on their mind. Not to be confused with the general emails you’re already planning to send to all employees about open enrollment. If you kept a list of people from the benefits fair who said they were interested in particular benefits and wanted more information, it’s a great idea to send group emails with specifics to the various groups. This open enrollment season is also a great time to help employees with one of the most crucial issues in today’s workplace—the need for greater financial wellness. If your workers are anything like the average American employee, they’re likely to be weighed down with heavy consumer debt and living from paycheck to paycheck. That’s a hard-enough problem on its own. But what makes it even tougher is that money problems don’t just stay at home. 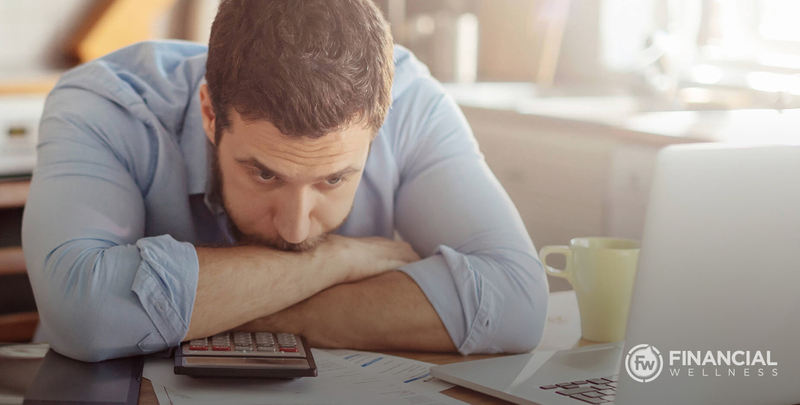 Those troubles follow your employees into the workplace, resulting in lower productivity, higher absenteeism, and even a significant amount of time trying to handle financial issues while on the clock! Ready to learn more about how financial wellness is impacting your own business? One of the best ways to start is by getting your company’s retirement health score right here!